- BEAN, LEON L. "L.L." Home » BEAN, LEON L. "L.L." LEON L. "L.L." BEAN (1872-1967). Bean was the founder of the popular Maine clothing retailer. L.L. BEAN. 1937, Delaware. 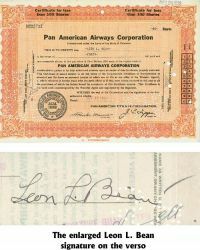 Certificate for 40 shares of the Pan American Airways Corporation issued to and signed by "Leon L. Bean" on the verso. The stock has orange borders and background with a facsimile signature of Juan Trippe. The piece is lightly punch cancelled, including two small holes that barely touch Bean's signature. It is in very fine condition overall.